SHOWN: Tasty holiday treats will be available at the Memorial Health System (MHS) Volunteer Corps annual holiday goodie sale on December 7. All of the treats are made by members of the MHS Volunteer Corps. 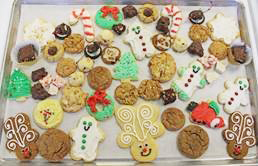 The Memorial Health System Volunteer Corps is hosting its annual holiday cookie and candy sale beginning at 8:30 a.m. on Friday, December 7, in the Memorial Hospital lobby, 511 NE 10th, in Abilene. The sale will last until the goodies are gone. This sale is open to the public, so come pick up some tasty treats. Get there early, because they go quickly. You can choose from a variety of festive homemade cookies, cinnamon rolls, breads, and candies. The cost is 50 cents per cookie, $1.50 per cinnamon roll, and prices will vary for other items. Proceeds benefit Memorial Health System Volunteer Corps projects. If you have any questions, contact Michelle McClanahan, Director of Memorial Health System Volunteer Services, at 785-263-6692.